Google Cloud Anthos Migrate - The Future of Cloud Lift & Shift? Will Google Kubernetes Engine (GKE) provide an advantage that AWS and Azure can’t match for lift and shift? Both AWS and Azure have gone the route of offering some VMware staging area for legacy applications. AWS has VMC on AWS and Azure has a hosted VMware solution. The idea is to keep operational differences to a minimum between on-premises hosting and cloud. However, the price has been a consistent factor. Customers worry inertia will result in indefinite reliance on VMware vSphere software. The CTO Advisor will be broadcasting live Webinars during Dell Technologies World from April 30th to May 2nd. Sign up to receive the schedule and links to the individual Webinars. Your email address will not be shared with sponsors. We may send a follow-up email on behalf of one or more of our sponsors. Intel’s DC Persistent memory is revolutionary that will power the next innovation in business intelligence. Intel DC Persistent Memory is BIT addressable 3D-NAND (FLASH) memory. The last Intel product allows you to insert it into DIMM slots on a server. However, what does that mean for performance and business capability? I think SAP HANA is the best example of what’s possible. Software as a Service or SaaS is Pubic cloud computing. I was tempted to make this statement in a tweet vs. dedicating a whole blog post, but I wanted to add to the knowledge graph on the topic. Also, Matthew Broberg asked a great follow-on question as part of a spirited LinkedIn discussion. If you move all your virtual machines to AWS do you now have a cloud? Or is it something else? If the cloud is an operating model vs. a place, what model do you have in lift and shift? I submit that you have hybrid-infrastructure. If the cloud is an operating model, it must be equally valid that hybrid-infrastructure is an operating model. Are CIO's Missing the Metadata Bus? AI/ML vendors at large present the magical view that you ask your data lakes a business question and out shoots an answer that drives a new business insight. I spoke with the Chief Data Officer (CDO) of a Fortune 500. The company struggled with normalizing over 100 different data sources. Data scientists spent up to 70% of their time normalizing the data before even applying algorithms. Will leveraging metadata decrease time to value for data analysis? That one time you weren’t able to recover the set of emails that were a request due to legal hold proved painful. You now take backup exceptionally seriously. So much so, you now have hundreds of TB’s of data sitting on archive media. Economic advisors call it the new oil. So much insight could be made available via that wealth of data; only if there were an easy button to ingest what’s an organic, unstructured data lake. Enter the new era of backup companies such as Cohesity. What’s the new reality of IT? You read the latest from cloud providers and management consultants and you walk away thinking every company from the corner baker to Fortune 100 enterprises has digitally transformed and moved to a cloud-native environment. You then get data from IT vendors showing 90% of the companies that run to the cloud, move back on-prem. We know the truth is somewhere in-between. So, what’s the deal? I the last 24-hours over $760 million has been invested into two companies that on the surface are IT backup products. With Cloud computing is quickly becoming a center for enterprise data, one has to question the valuation of these companies. The CTO Advisor has held the position that this data protection space isn’t about backup. It’s about the ability to leverage data regardless of the location. Cloud computing companies will continue to add capabilities such as ML/AI and even Quantum computing that will not easily deploy inside the four walls of traditional enterprises. CTO’s will be challenged to leverage these services against massive quantities of data. The need for low latency to these data sets may very well become the new arms race in enterprise data. It’s why I believe the $3.3 Billion evaluation for a company like Rubrik is just a drop in the bucket of the total addressable market for what we call data protection today. 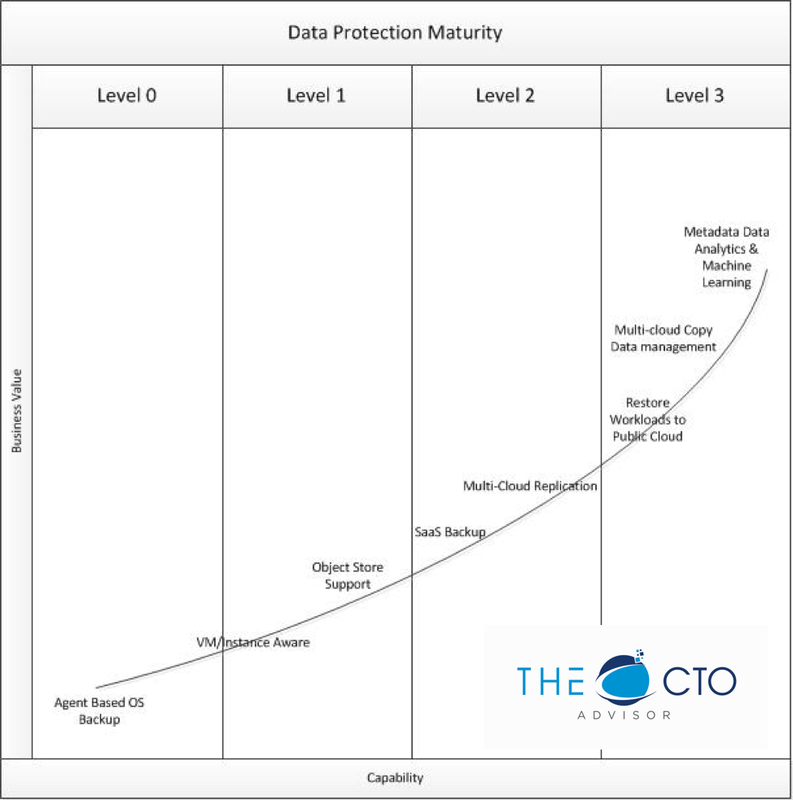 I created this maturity scale as a tool to help identify where your data protection/management strategy resides on the hype curve. While I haven’t published it until today, it’s already a year old. I’ve moved on to a “Data Infrastructure” framework. Let me know if you’d be interested I a private walkthrough of the framework. Increased productivity powers economic growth. A recent replay of Planet Money discussed the power of well - power. The ability to do more with less increases efficiency of a system. Increased efficiency leads to gains in productivity. Thus increased economic activity. It’s a simple concept of economics. Public cloud is another example. Small and large businesses alike take advantage of what appears infinite scale of services from AWS, Google Compute, and Microsoft Azure. The services are cheap and highly effective when used in chunks. However, organizations have discovered moving entirely to these services exclusively proves cost prohibitive. Data protection products have evolved from the backup category to a category that enables the protection and mobility of data. This report will examine the essential functions of modern-day data protection products and provide context to the relationship between data protection and data management. Consider some simple parallels with the transportation industry as you continue to examine how Public Cloud impacts your existing IT infrastructure. Ground transportation offers a tremendous mix of capabilities from rail, trucks, and light vehicles. Data center infrastructure provides the most flexibility, including legacy app support. There are some things you'd never transport by air as it makes little sense. TLDR – I’m headed to VMware as a Solutions Architect for the Midwest region. Is Nutanix a Cloud Company? One of the most popular videos on the portal describes how Nutanix isn't a cloud company. After hosting theCube for Nutanix .NEXT 2018, I thought it time to ask and answer the question again. What value does Nutanix bring environments looking to adopt enterprise cloud technologies? What were the key announcements from .NEXT that point to a coherent cloud strategy and where are the gaps? This Analyst Note discusses the big takeaways from the conference. Configuration management is about controlling the state of all of the systems and applications in your environment. I call it the metadata of your IT operations. While data replication helps to protect from data loss, configuration management remains as essential as data replication. Moving legacy application architectures to the public cloud bring with it many challenges. In many cases, it’s a question of finding a problem for the solution public cloud offers. On the surface, the architecture of legacy applications doesn’t appear complementary to public cloud design and consumption. However, there are use cases where legacy applications fit natively into the public cloud. I’ve poked and prodded the team at Rubrik since first briefed on their data protection product. The spokespeople remain careful in the description of the product suite. It is a data protection product with additional benefits powered by a powerful metadata engine. Make no mistake Rubrik’s product is a robust metadata driven foundation that has data protection features. The company marketing remains careful not to compete with primary storage companies directly or claim primary storage functionality. Disaster recovery is hard enough. People and process are equally important as the technology. Our presenter, Keith Townsend led the effort for the disaster recovery design and operations for a Fortune 200's SAP implementation. Keith will share learnings from that experience beyond SAP and how Public Cloud brings the similar technical capability to smaller organizations.